For the extra curious crowd I’ve uploaded pictures from my recent colonoscopy. I’m just a tourist in there, but the doc told me that these are the pics from the perspective of my colon looking at my Crohn’s. I think the pics on the left and the bottom show it best. You can see the superficial ulcerations I mentioned in my colonoscopy conundrum post. The lumpy looking thing is a remnant of the surgery I had in the 80’s. 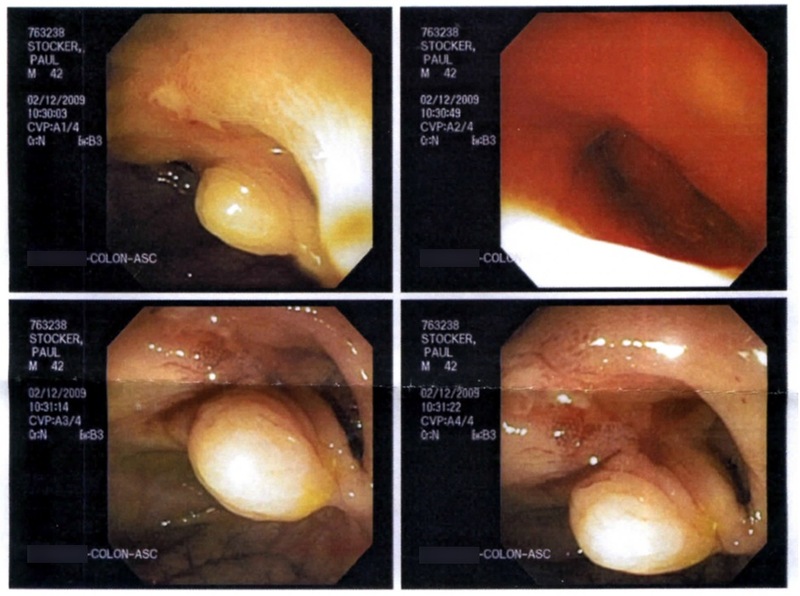 I tried to get my pictures from a colonoscopy right before I started the SCD, but they were not kept so I cannot do the comparison I was hoping to do. Word to the wise: get your records right away – don’t assume that the clinics and hospitals keep them. Very interesting pix… I recall almost 10 years ago upon my most recent series of surgeries, I had the urge to show my pix to others… the reactions can be surprising… but here’s to ya!!! Perhaps, if I run into that wall again I’ll put mine on my new site at http://www.glute-freesimplicity.com.